Does anyone know if they’ve explained why Emmara’s previous card was a Shaman, but her new one is a Cleric? The two jobs are similar, yes, but since we make a distinction on the type line, we might like to know what prompted the change. Maybe she just got tired of her previous career. Apart from that, though, I have to say that I quite like her new card. She’s more fragile, yes, but her new ability, combined with a much cheaper mana cost, gives her the potential for increasingly explosive successive turns when your deck has a lot of convoke cards. It’s far from out of the question to be putting down Siege Wurm and March of the Multitudes when your opponent still has 2/2s. And if that sounds like too much pie in the sky, she attacks efficiently and gives you more creatures with which to go wide without requiring any additional mana investment. She works very well with Ajani Goldmane, and it’s kind of too bad for Selesnya that he’s not in Standard right now. Fun fact: the original Emmara Tandris was supposed to be printed with the rules text of Voice of Resurgence in her Dragon’s Maze appearance. But they needed to put the 10 “maze-runners” of the set at rare, and Voice of Resurgence is very mythic in power level. Anywho, Emmara 2.0 is already better than the original Emmara. A 2/2 body won’t turn heads, but her tapping creates a Soldier token. 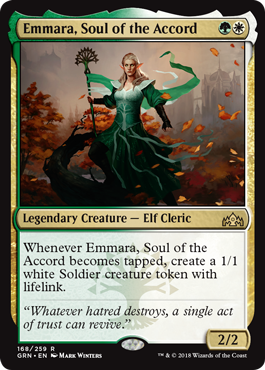 And it does not matter how Emmara becomes tapped; she pairs very well with convoke spells and other tap triggers, and you can attack with her if you have nothing else to do. Emmara is not absurdly powerful, but she definitely has a lot of subtle power and ability to enable the convoke deck. While the presence of Goblin Chainwhirler may keep Convoke.dec in check for the nonce, I could see Emmara making waves when the presence of the whirly dude wanes.